The requirement is to have single sign on across different web applications - once the user is authenticated he should be able to access all the web applications with no further authentication [by him self]. Also, the web applications need to access a set of back-end services with the logged in user's access rights and the back-end services will authorize the user [end-user] based on different claims, like role. 2. WebApp finds out user is not authenticated and redirects to the SAML2 IdP. 4. Now, the WebApp needs to access a back-end web service with the logged in user's access rights. 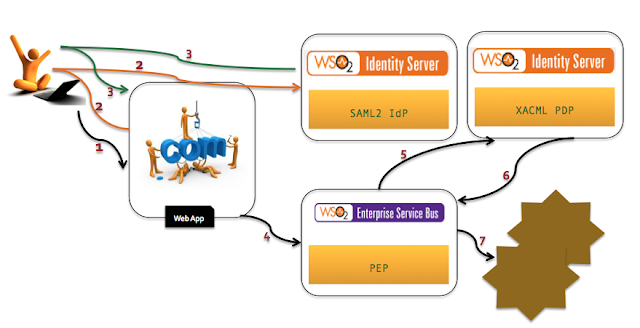 WebApp passes the SAML token to the PEP based on WS-Trust and authenticates it self [WebApp] to the PEP via trusted-sub-system pattern. 5. PEP will call XACML PDP to authorize the user, based on the claims provided in the SAML token. 6. XACML PDP returns back the decision to the PEP. 7. If it's a 'Permit' - PEP will let the user access the back-end web service.